In the final game of the three-game series between the U.S. and Canadian women's development sled hockey teams, the U.S. captured a 2-1 victory at the Herb Brooks National Hockey Center in St. Cloud, Minn. Erica Mitchell (Chicago, Ill.) and Madison Eberhard (Getzville, N.Y.) scored for the United States, which were shut out by Canada in the first two games by 1-0 and 2-0 results. For game recaps and boxscores, see below. 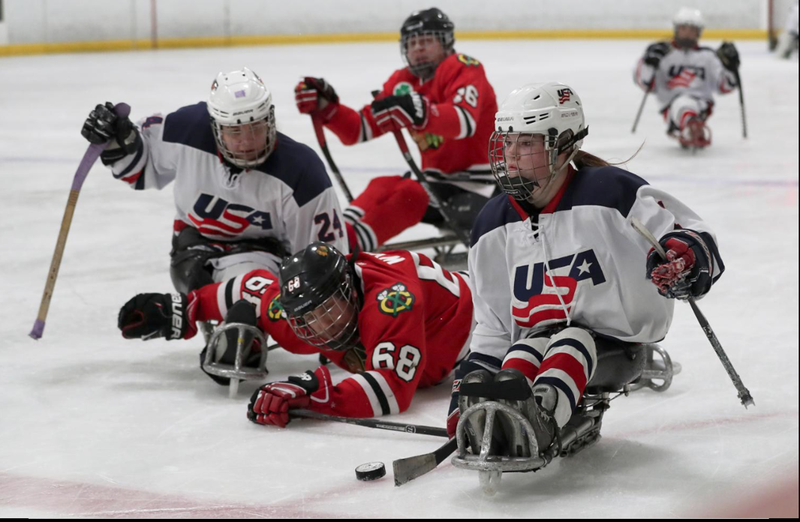 The U.S. Women's Development Sled Hockey Team, which originated in 2007, is in its first season under the governance of USA Hockey. For the full U.S. roster, click here. The three-game series was live streamed by HockeyTV and held during USA Hockey's 12th annual Hockey Week Across America, an initiative designed to engage the hockey community in celebrating the sport at all levels and exposing the game to new audiences. Erica Mitchell (Chicago, Ill.) and Madison Eberhard (Getzville, N.Y.) both scored and Hope Bevilhymer (West Jordan, Utah) made six saves to lead the U.S. to a 2-1 victory on Sunday (Feb. 24). The first period saw both teams score just 19 seconds apart. Mitchell gave the U.S. a 1-0 lead 5:22 into the game off an assist from Kelsey DiClaudio (Pittsburgh, Pa.) before Canada's Raphaelle Tousignant connected off a pass from Ashley Gourde even the score. In the middle stanza, Eberhard put the U.S. ahead, 2-1, at the 12:22 mark. DiClaudio was again behind the play, this time taking a pass from Rachel Grusse (Gastonburry, Conn.) and finding Ebehard for the eventual game-winner. The final frame saw the U.S. control the majority of play. Despite holding a 14-3 shot advantage in the stanza, neither team was able to convert as the U.S. skated to a 2-1 win. The U.S., which did not allow a shot on goal in the second period, limited Canada to just seven shots on goal, six of which Bevilhymer was able to turn aside. Sophie Forest started the game in net for Canada, denying four of the five shots she faced before Jessie Gregory made 13 saves on 14 shots she saw in relief. U.S. goaltender Gabby Graves-Wake (Chandler, Ariz.) made four saves as the U.S. fell to Canada, 1-0, in its second game of the series on Saturday (Feb. 23). The game opened with Canada's Camiille Lalonde scoring at the 1:36 mark of the first stanza. Raphaelle Tousignant earned an assist on what would be the game's only goal. While in search of a tying goal, the U.S. was able to limit Canada to just two shots over the final two periods of play, which included denying Canada a single shot on goal in the middle frame. Unfortunately, Canada's Sophie Forest was able to turn aside all six U.S. shots she faced over the last 30 minutes of play to secure the 1-0 win for Canada. In the opening game of the series, U.S. netminder Rosie Robinson (Sheboygan, Wis.) made 14 saves as the U.S. fell to Canada, 2-0, here at the Herb Brooks National Hockey Center in St. Cloud, Minn., on Friday night (Feb. 22). After a scoreless first period that saw both teams generate chances, Canada was able to take a 1-0 lead when Camiille Lalonde finished a pass from Christina Picton at the 9:32 mark of the middle frame. In the final stanza and with the U.S. pressing for a tying goal, Picton beat Robinson off a pass from Nandini Sharma to give Canada 2-0 victory.